Albert Einstein has long been considered a genius by the masses. He was a theoretical physicist, philosopher, author, and is perhaps the most influential scientists to ever live. Einstein has made great contributions to the scientific world, including the theory of relativity, the founding of relativistic cosmology, the prediction of the deflection of light by gravity, the quantum theory of atomic motion in solids, the zero-point energy concept, and the quantum theory of a monatomic gas which predicted Bose–Einstein condensation, to name a few of his scientific contributions. 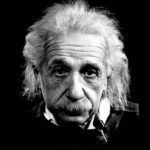 Einstein received the 1921 Nobel Prize in Physics “for his services to Theoretical Physics, and especially for his discovery of the law of the photoelectric effect.” He’s published more than 300 scientific works and over 150 non-scientific works. Einstein is considered the father of modern physics and is probably the most successful scientist there ever was. "Love is a better teacher than duty." "True art is characterized by an irresistible urge in the creative artist." "God may be subtle, but he isn’t plain mean."